Embrace it! 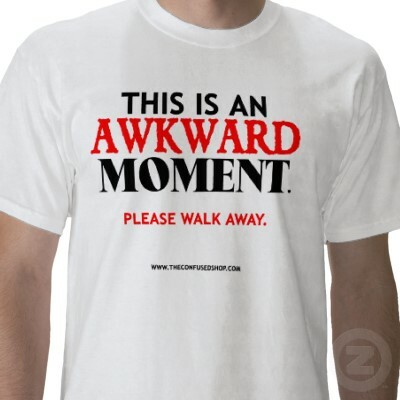 Awkward moments are good for you! I was taking a turn about the Equestrian Center after riding today when I had an experience that definitely made me take stock in my Oreodom. I was nearly of the gate and back to my car when an older man rode up to me in his golf cart and asked what I was doing there. To be fair, there was a competition going on so most of the people there were in formal riding gear, though I had hoped my jodhpurs would have helped me blend in a bit. Now, while I’m sure the gal was at the last meeting, I didn’t know who he was talking about and I told him so. CON: Even with the jodhpurs and tightly-pinned bun, he still noticed I was black. PRO: Though he noticed I was black, he still talked freely to me, suggesting that he didn’t think I was angry RBP. CON: He made the small circle of people around us uncomfortable, as they all did quick side glances at me to see how I would react. PRO: My Oreo-sense allowed me to put everyone else at ease by responding sweetly and without malice to his thoughtful inquiry. CON: Getting away with saying it once made him say it again and more when he added: “Oh yeah, and there’s this other colored fellow who owns a couple of horses down the way. I mean, I think he’s a black guy, he’s really, you know, dark like you are.” Equal amounts of uncomfyness followed. PRO: Each time he said an adjective that described the hue of my skin, it made my back stiffen straighter and straighter–which made my my posture much better for my next riding lesson. His questions also made it clear that there are other Oreos nearby…if any of you are reading this, let me know you’re out there and we’ll grab a scone or something. What’s the most uncomfortable thing someone’s asked you in public? How did you respond? Let us know in the comments!